Man has always known that the brain is the center of human behavior. 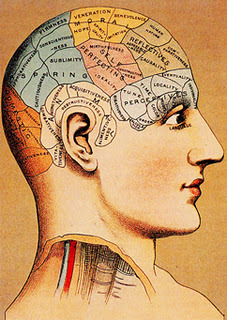 Early attempts at understanding which locations in the brain controlled different functions were non-scientific and included such practices as phrenology. This pseudoscience believed that by feeling the bumps of a person’s head it was possible to draw conclusions about specific brain functions and traits of the person. One of the most exciting developments in contemporary neuroscience is the recognition that the human brain processes information via different brain circuits or loops, which at a higher level can be studied as large-scale brain networks. 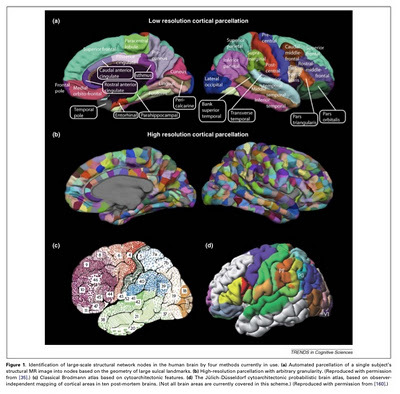 Although the modular view still provides important brain insights, the accumulating evidence suggests that it has serious limitations and might in fact be misleading (Bresslor and Menon, 2010). One of the best summaries of this cutting edge research is that by Bresslor and Menon. Large-scale brain network research suggests that cognitive functioning is the result of interactions or communication between different brain systems distributed throughout the brain. That is, when performing a particular task, just one isolated brain area is not working alone. Instead, different areas of the brain, often far apart from each other within the geographic space of the brain, are communicating through a fast-paced synchronized set of brain signals. These networks can be considered preferred pathways for sending signals back and forth to perform a specific set of cognitive or motor behaviors. To understand preferred neural pathways, think of walking on a college campus where there are paved sidewalks connecting different buildings that house specialized knowledge and activities. If you have spent anytime on a college campus, one typically finds foot-worn short cuts in the grass that are the preferred (and more efficient) means by which most people move between building A and B. The combined set of frequently used paved and unpaved pathways are the most efficient or preferred pathways for moving efficiently between buildings. The human brain has developed preferred communication pathways that link together different brain circuits or loops in order to quickly and efficiently complete specific tasks. As illustrated in the figure above, neuroscientists have identified a number of core brain network nodes or circuits. The important new insight is that these various nodes or circuits are integrated together into a grander set of higher-level core functional brain networks. Three important core networks are receiving considerable attention in explaining human behavior. The default mode (DMN) or default brain network (shown in blue) is what your brain does when not engaged in specific tasks. It is the busy or active part of your brain when you are mentally passive. According to Bresslor and Brennon the “DMN is seen to collectively comprise an integrated system for autobiographical, self-monitoring and social cognitive functions.” It has also been characterized as responsible for REST (rapid episodic spontaneous thinking). In other words, this is the spontaneous mind wandering and internal self-talk and thinking we engage in when not working on a specific task or, when completing a task that is so automatized (e.g., driving a car) that our mind starts to wander and generate spontaneous thoughts. As I have discussed previously (at IM-HOME blog), the default network is responsible for the unquiet or noisy mind. And, it is likely that people differ in amount of spontaneous mind wandering (which can be both positive creative thinking or distracting thoughts), with some having a very unquiet mind that is hard to turn off, while others can turn off the inner thought generation and self-talk and display tremendous self-focus or controlled attention to perform a cognitively or motorically demanding task. 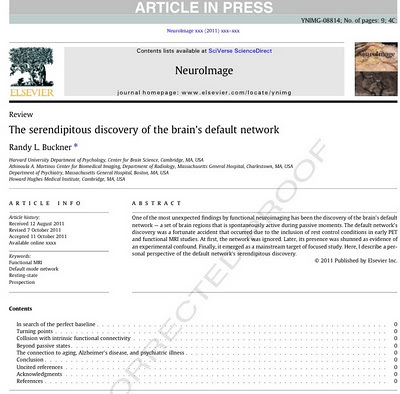 A very interesting discussion of the serendipitous discovery and explanation of the default brain network is in the following soon to be published scientific article. The salience network (shown in yellow) is a controllor or network switcher. It monitors information from within (internal input) and from the external world around us, which is constantly bombarding us with information. Think of the salience network as the air traffic controllor of the brain. Its job is to scan all information bombarding us from the outside world and also that from within our own brains. This controller decides which information is most urgent, task relevant, and which should receive priority in the queue of sending brain signals to areas of the brain for processing. This controlling network must suppress either the default or executive networks depending on the task at hand. It must suppress one, and activate the other. 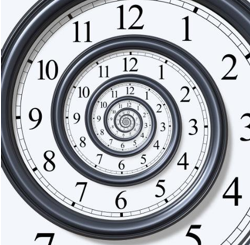 Needless to say, this decision-making and distribution of information must require exquisite and efficient neural timing as regulated by the brain clock(s). Finally, the central-executive network (CEN; shown in red) “is engaged in higher-order cognitive and attentional control.” In other words, when you must engage your conscious brain to work on a problem, place information in your working memory as you think, focus your attention on a task or problem, etc., you are “thinking” and must focus your controlled attention. 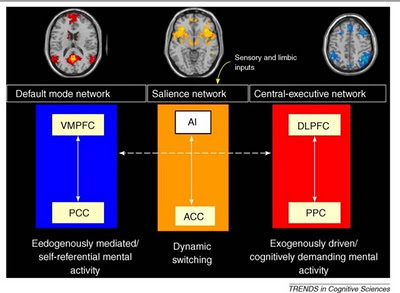 As I understand this research, the salience or controller network is a multi-switching mechanism that is constantly initiating dynamic switching between the REST (spontaneous and often creative unique mind wandering) and thinking networks to best match the current demands you are facing. 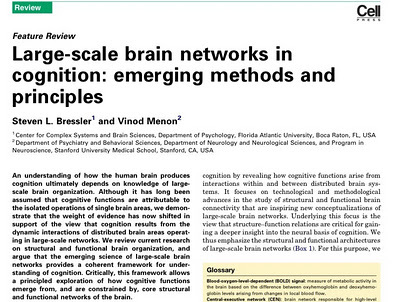 According to Bresslor and Melon, not only is this large scale brain network helping us better understand normal cognitive and motor behavior, it is providing insights into clinical disorders of the brain. Poor synchronization between the three major brain networks has been implicated in Alzheimer’s, schizophrenia, autism, the manic phase of bipolar and Parkinson’s (Bresslor and Melon, 2010), disorders that have all been linked to a brain or neural timing (i.e., the brain clock or clocks). I also believe that ADHD would be implicated. If the synchronized milli-second based communication between and within these large networks is compromised, and if the network traffic controller (the salience network) is disrupted in particular, efficient and normal cognition or motor behavior can be compromised. I find this emerging research fascinating. I believe it provides a viable working hypothesis to explain why different brain fitness or training neurotechnologies have shown promise in improving cognitive function in working memory, ADHD, and other clinical disorders. It is my current hypothesis that various brain training technologies may focus on different psychological constructs (e.g., working memory; planning; focus or controlled attention), but their effectiveness may all be directly or indirectly facilitating the synchronization between the major brain networks. More specifically, by strengthening the ability to invoke the salience or controller network, a person can learn to suppress, inhibit or silence the REST-producing default brain network more efficiently, long enough to exert more controlled attention or focus when invoking the thinking central executive network. Collectively these brain fitness technologies may all improving the use of those abilities called executive function, or what I have called the personal brain manager. Those technologies that focus on rhythm or brain timing are those I find most fascinating. For example, the recent example of the use of melodic intonation therapy with Congresswoman Gabby Giffords (she suffered serious brain trauma due to a gun shot) demonstrates how rhythm-based brain timing therapies may help repair destroyed preferred and efficient neural pathways or, develop new pathways, much like the development of a new foot worn pathway in the grass on a college campus if a preferred pathway is disrupted by a new building, temporary work or renovation, or some other destruction of a preferred and efficient network of movement path. To understand the beauty of the synchronized brain, it is best to see the patterns of brain network connections in action. Below is a video called the “Meditating Mind.” I urge you to view the video for a number of reasons. A number of observations should be clear. First, during the first part of the video the brain is seen as active even during a resting state. This is visual evidence of the silent private dialogue (REST) of the default mode or network of the brain. Next, the video mentions the rhythm of increased and decreased neural activation as the brain responds to no visual information or presentation of a video. The changes in color and sound demonstrate the rich rhythmic synchronization of large and different parts of the brain, depending on whether the brain is engaged in a passive or active cognitive task. The beauty of the rapidly changing and spreading communication should make it obvious that efficient rhythmic synchronization of timing of brain signals to and from different networks or circuits is critical to efficient brain functioning. Finally, the contrast between the same brain under normal conditions and when engaged in a form of meditation is striking. Clearly when this person’s brain is mediating, the brain is responding with a change in rates and frequency of brain network activation and synchrony. As I described in my personal IM-HOME based experience post, mastering Interactive Metronome (IM) therapy requires “becoming one with the tone”…which sounds similar to the language of those who engage in various forms of meditation. Could it be that the rhythmic demands of IM, which require an individual to “lock on” to the auditory tone and stay in that synchronized, rhythmic and repetitive state for as long as possible, might be similar to the underlying mechanics of some forms of meditation, which also seek to suppress irrelevant and distracting thoughts and eventually “let the mind go”—possibly to follow a specific train of thought with complete and distraction free focus. Yes…this is speculation. I am trying to connect research-based and personal experience dots. It is exciting. MyIM-HOME based induce personal focus experience makes sense from the perspective of the function and interaction between the three major large-scale brain networks.